Every dispersal is different, I suppose because each coyote and every family is different. When it’s forced rather than the coyote simply leaving of his/her own accord, I tend to see Moms driving out females, and Dads or even brothers driving out males (though in this latter case, I’ve seen female siblings join-in the driving out process). Some of the youngsters drag their feet or even try to return several times, always without success. I’ve seen “cold turkey” dispersals where youngsters are gone suddenly without apparent warning, I’ve seen gradual dispersals, and I’ve even observed some parents hold on by visiting their dispersed offspring in their new areas. Here in this posting, I’ll describe three very different dispersals. 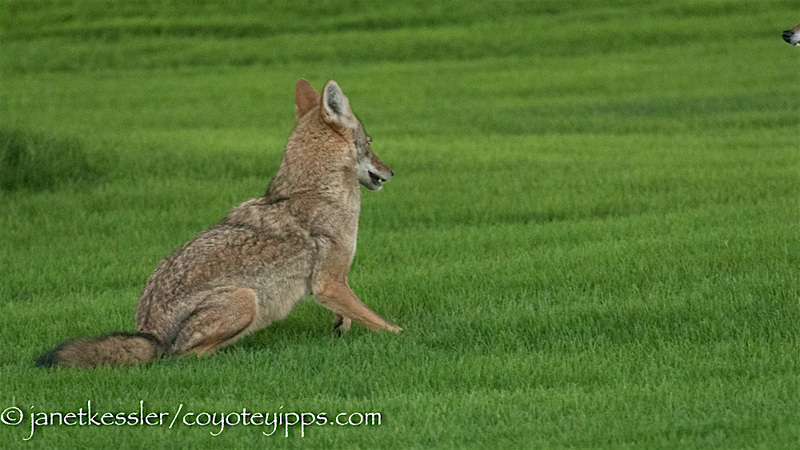 1) The dispersal of the coyote in the photo below was very gradual and of his own volition. He began leaving for a day at a time to begin with, and then for longer periods of time, returning for increasingly-brief periods which became less frequent over several months, until we no longer saw him again. This happened in the early springtime. He was almost exactly two years old when he left for good. His was a smooth transition: he was not pushed out, but rather was allowed to disperse at his own pace. He had stayed to help with the family’s next litter after him, but was gone right before the following year’s litter arrived. He was a mellow fellow who helped keep order by consoling his siblings when they needed it, and was a stickler for order when things got out of hand between them. 2) The dispersal that warmed my heart the most was that of this rambunctious yearling male below, who had a testy relationship with an older female sibling, but was always on good terms with his parents and a brother. And then, one day, I saw Dad treat him truly as an equal for the first time. I sensed a huge joy and freedom in this coyote which I had never seen before, and maybe this treatment gave him the confidence to be so. It was as though this were a rite of passage before leaving home. So it was a warm sendoff, almost a goodby party. The “ceremony”, if you will, consisted of an evening of frolicking with Dad as an equal, with Dad instigating the play: they ran together, bucking up, and nipping each others’ ears or heels, and they jumped on each other as equal buddies and friends, liberated from any hierarchy, just playing. The youngster exuded a joy and sense of freedom, along with stature and confidence which he hadn’t displayed before. Two days later he was gone. It was mid-summer. We saw him a few times in a park nearby, but then he was gone from there, too: he was now out making his own way in the world. Heartwarming sendoff: father and son play a few days before son leaves for good on 5/18 at 14+ months of age. We see him 10 days later in a park nearby, but then never again. 3) The most unusual dispersal is one that happened almost “backwards”. In this case, a youngster, at the age of a year and a half, was banned to the fringes of her territory by her family which, except for Dad, wouldn’t have much to do with her. She was hounded repeatedly by her brother and her mother. She put up with it and didn’t leave, she just kept her distance. Finally, when she was 2 1/2 years old, the family, which by now consisted of only Mom and Dad, left, leaving her behind on their territory. It was almost like a dispersal in reverse. I never saw Mom again, but Dad came visiting regularly at first, and then less and less. Below is a series of photos showing one of Dad’s last visits in November. The family bond between him and his daughter had been weakening over time, and compatibility had become rougher and testier with each of Dad’s succeeding visits. She used to experience the same joy as seen above between father and son. The daughter always remained exquisitely happy to see Dad, but Dad became more and more hierarchical and the affectionate part of their bond slowly dissipated. Although Dad’s treatment of his daughter seems harsh, he was cutting the ties much more gently than if he had simply left for good. She races enthusiastically to greet Dad when he appears after a long absence. His look tells her to crouch and approach carefully. She is facing him and keeping down in this photo here. In the above six photos, she is totally submissive, and he stands above her with hackles up: the hierarchy has little give or affection here. She feels comfortable enough to trot off with him, but is not allowed to do so until she knows her place. A little later, testiness is the order of the day. This is one of the last visits Dad made to visit her. In many cases, coyotes are driven off harshly by parents or siblings, and I’ve written about this before. In another case, year after year, a pair of coyote parents has led their youngsters through their fragmented territory, starting when they were about 6 months old: there’s not much stability in this kind of bohemian/gypsy movement, and I suppose the pups eventually tired of this because by 9 months of age, none were around anymore. I’ve been lucky enough to discover several coyotes I knew as youngsters in their new locations. In one case, I’ve followed a family for 12 years through four generations, and I’m now following that fourth generation in a new location where it appears there may be a fifth generation on the way! I have recently heard several reasons given for why there have been more coyote sightings in San Francisco: “It is dispersal season”, “there has been a population explosion”, “garbage being left out is to blame for sightings and for all dog related incidents”. These reasons are incorrect according to my own observations, and this has been confirmed by others who study coyote behavior. I will try to explain what is going on. “Dispersal season”. Coyotes are raised in monogamous families by both of their parents. When coyotes mature, they are either allowed to stay on in the family territory — they will be called “betas” — or they are driven out, a phenomenon which takes place throughout the year, not at any one time of the year. The dispersal is dependent on a variety of factors specific to the territory’s carrying capacity and to the family situation. For instance, I’ve seen a mother become intolerant of the presence of a daughter who could possibly displace her as the breeding female, therefore becoming the dominant female — the youngster was driven away by incessant attacks. A mom drove out a jealous male yearling to protect a new litter. A dad drove out a son who didn’t get along smoothly with the other siblings. A widowed father drove out a son exhibiting possessiveness of a new female. A domineering brother drove away his brother, probably for reproductive advantage. Although I have not been able to see where these dispersed individuals go, I have been able to watch the strife that preceded the sudden departure of these individuals. The departures occurred in January, in February, in June, in April and one in November — not during any set “dispersal season” — coyotes don’t just pick up and go in the fall, nor are they driven out specifically at this time of the year. And I’ve seen intruders in established territories in January, February and early March — not in the fall during the purported “dispersal season”. Although more coyotes might disperse when the food supply is low — which would be throughout the winter in most places — this is not occurring now, in September-October, when pups are a mere 6 months old. Although a family group can be as large as nine in a large territory, and indeed I have read in the news that a family of 9 was seen hunting together in Southern California, which would mean that the family of 9 has remained together, I have never seen such a large family unit here in San Francisco. Also, in San Francisco I have not seen a steady increase in the number of coyotes over an extended period of time in families within their claimed territories. 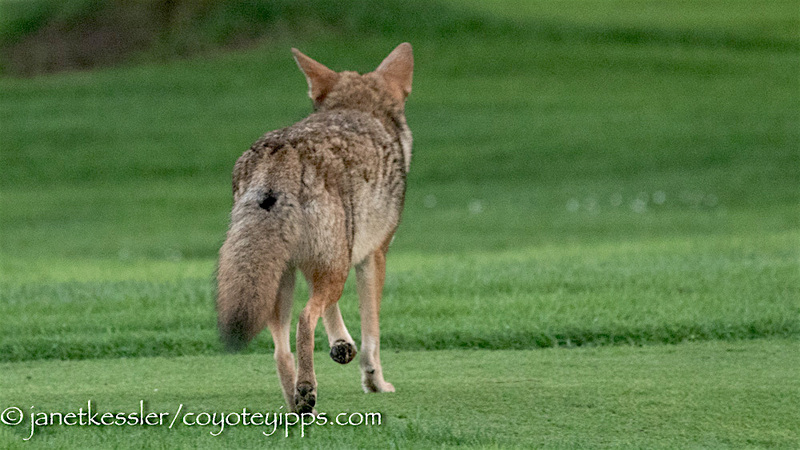 I have seen constant fluctuations in coyote populations in these territories — territories in our parks and golf-courses. All of these territories still have only one family unit, with populations which have remained incredibly stable. The fluctuation over a six year period in one family ran like this: 2 -> 3 -> 2 -> 5 -> 3 -> 2. This year, in one of the parks, just one pup was born, which suggests to me that saturation might have been reached in their numbers. Since coyotes appear to need about a square mile of territory per coyote to support themselves, and even if they needed half this amount of land, San Francisco will never be “overrun” by coyotes. There has not been a “population explosion”. 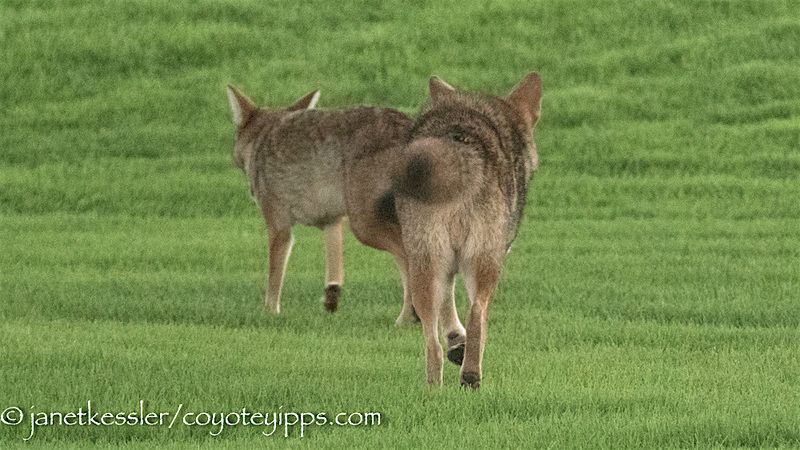 Coyotes population numbers are regulated depending on the resources and carrying capacity of the land. When the land no longer provides for their needs, they will no longer increase their numbers. They don’t need “human management” to interfere with this. Coyotes-seen-in-the-neighborhoods recently in San Francisco is not necessarily an indication that there has been a population explosion. Coyotes “trek” every single night through our neighborhoods. They always have. This is normal, healthy, coyote behavior. They are marking their territories and searching for good hunting areas. They’ll mostly dig for gophers and voles — these are their staples here in San Francisco, but they also eat fruit, and larger prey if it presents itself, and they’ll eat food left out in your yard. If, as they are trekking through, they find a cache of gophers, or even skunks, raccoons or even a free roaming cat if one should appear opportunistically, they will keep returning to the area for a while in hopes of finding more of the same bonanza. An increase in the number of sightings could be due simply to more people in the city to notice them, more folks out of doors in the city, more internet use, and more social media such as Facebook and Nextdoor, and to there being more dogs than ever before: all coyote issues revolve around pets. It could also be due to the drought, as proposed by a number of ecologists, which might be diminishing their gopher supplies, causing coyotes to expand their home ranges and hunt more during daytime hours. But coyotes are not overrunning the city. In one of the parks here in San Francisco, two small dogs were grabbed by coyotes within a month of each other. The city has told residents that all coyote incidents, including these, were due to feeding coyotes, in this case leaving garbage out. The thinking seems to be that the coyotes are being drawn by the garbage into the more populated parts of the park where they are becoming more familiar with dogs and people, and that it is because of this that they grabbed the two dogs. But garbage lying around does not cause coyotes to grab dogs. Whether there is garbage or not — and garbage has been in these parks for years without incident — small dogs may very well be taken unless the owners are vigilant and follow the guidelines. These incidents were not due to garbage being left out. They were due to the opportunistic behavior of coyotes which will continue whether or not garbage is out in the parks. In addition, these incidents were not due to habituation of the coyotes. In an urban setting, ALL coyotes become habituated — they become used to seeing people. 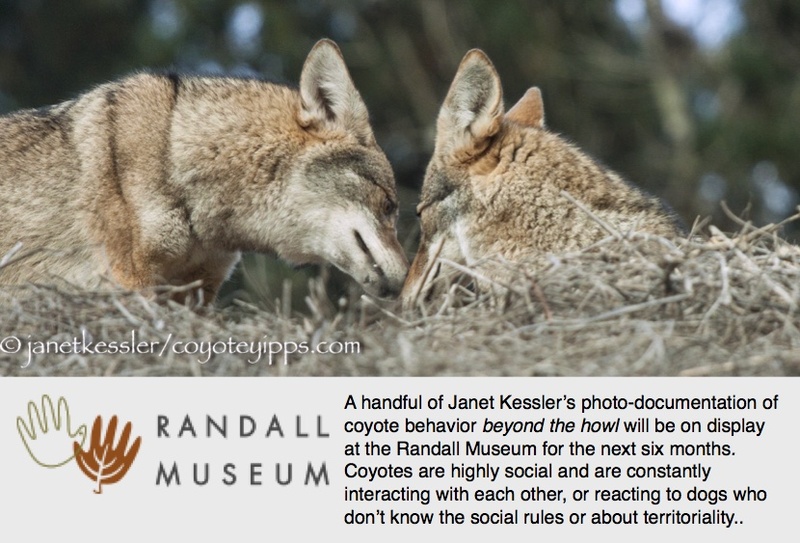 Habituation does not cause coyotes to approach people. However, habituated or not, coyotes could very well approach little dogs who are not intensely supervised, be they on or off-leash if they think they can get away with it. And, coyotes may message larger dogs, and they may even message leashed dogs, again, if the opportunity is right. You can prevent this. “Habituation is a basic activity whereby an animal responds less to repeated stimuli in its environment. Habituation need not be conscious for it to occur. Habituation enables [animals] to distinguish meaningful information [i.e., threats] from background stimuli [non-threats]. It occurs in all animals.” [Wikipedia] In other words, coyotes who are around people begin slotting them more as “background stimuli” instead of responding to them by fleeing, as they would to a “meaningful danger”, i.e. predator. You indeed CAN condition and shape coyote behavior through food conditioning, but this is not going on in the park: no one is using food to make the coyotes come down and grab a dog. Note that food conditioning and habituation are totally different phenomena. Both little dogs were taken in a park known for its coyote sightings. One of the little dogs — a 7-pounder — had been allowed to run ahead of its owner on a wilderness trail which had a small sign stating that it was an on-leash only area. The little dog ran into the woods in pursuit of a coyote and was grabbed. Why hadn’t simple common sense been exercised? Why hadn’t the owner listened to folks warning him? — many folks had warned him. And most importantly, why was not the sign more prominent? The other dog survived his ordeal. The owner visited a park at 6:30 in the morning. As he unleashed one of his two little dogs, he looked up to see a coyote right there in front of him who grabbed one of the little dogs. There were signs and there had been warnings, but the owner stated, after the fact, that he thought it would never happen to him. Vigilance, and a quick scan could have prevented this incident. Also, folks need to be aware that coyotes are diurnal and therefore may be out at any time of the day, and that their prime hunting and trekking times include the hour or so before dusk and the hour or so after dawn. Small dogs are least safe at these times when few other walkers are out. If folks don’t want to learn about coyote behavior, and if they can’t watch their dogs more carefully, might it be a good idea to put in a fenced area in this particular San Francisco Park? The fenced area would keep dogs, both large and small, from running off after coyotes into the wooded areas. Although it wouldn’t insure 100% protection unless it was coyote-proof (i.e. 6 feet tall with a roller bar on top), it would discourage and deter coyotes from the area, and with humans around to shoo off the rare coyote who gets in, it could increase little dog safety immensely. Folks would still need to be vigilant. Addendum: This posting was written because of “the misinformation tossed at us” See comments.